Staff members of the new A.J. Drexel Autism Institute, the first autism research organization focused on a public health science approach, tour their future office space. Dr. Jennifer Plumb, a clinical social worker, made this comment mid-way through a tour of the future home of the A.J. Drexel Autism Institute on Market Street in University City, Philadelphia. Right now the space leaves a lot to the imagination – a broad concrete floor, exposed ducts, and nothing breaking up the space except a lot of support pillars. Lindsay Lawer, the Institute’s senior manager, had been through before with the architects. She put her spatial recall to the test, as she pointed out the future locations of hallways, waiting rooms, offices and, and cubicles. And, of course, state-of-the-art technologies: Three clinical assessment rooms will have floor-to-ceiling two-way mirrors and advanced A/V tech for observation during evaluations conducted as part of the EARLI study and other research programs. But the most exciting thing about the tour was seeing the thought being put into the future experience of the space – the autism-friendly factors Plumb pointed out. 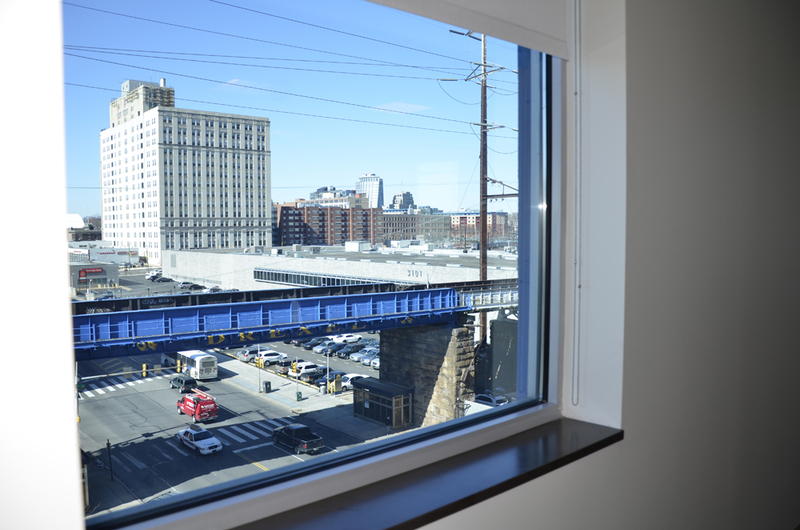 The view from a window in the Drexel Autism Institute’s waiting area overlooks the railroad trestle on Market Street painted with Drexel’s name and dragon. What did she mean by “autism-friendly”? In the broadest sense, when you’re looking at the world through the eyes of children and adults with autism, you design things a little differently. Will the shiny metallic panels inside the elevator be a problem? The elevator walls have kind of a wavy, holographic quality that autistic visitors might find distracting, or even troubling, if they have heightened sensitivities to visual sensations. Plumb and Lawer will discuss ways to address this concern. What happens if a child undergoing clinical assessment has to use the bathroom? Will they lose too much time in the transition between activities? Lawer clarified that there will be a bathroom built near the assessment rooms for families to use, so they won’t have to go through the complex sensory stimulation (and winding walk through the hallways) to get to the public restroom. How can families who visit for clinical evaluation have a smooth visit experience, from the parking lot, through the front lobby, and up to reception? The team began brainstorming a “welcome packet” with materials, maybe a visitor’s badge to bypass sign-in at the front desk, a parking pass, and a “social story” to prepare visitors for what it’s like to visit the building. Will the other tenants in the building be friendly and understanding when they encounter visitors who behave differently than they expect? Where might that happen? Elevators, hallways, lobby… Talk turned to conducting training for the neighboring tenants, maybe even an “Autism 101” video that could have a lot of other uses. The waiting area overlooks the Drexel train trestle! Plumb observed that a lot of little kids love trains – perhaps especially so, in her anecdotal observation, among kids on the autism spectrum. This way of thinking, in real world terms, is one small way the Institute’s staff is carrying out the mission that includes preventing disability associated with autism – by making sure that the spaces and interactions are empowering and enabling for all visitors to have a comfortable experience. Research in modifiable autism risk factors, including the flagship EARLI study: an overview and listing of current research efforts to find exposures or behaviors that, if changed, could lower the disability, impairment and morbidity associated with autism spectrum disorders. Research in autism services: An overview of current research efforts aimed at improving the delivery of care and services to individuals with autism spectrum disorders and their families. Projects: A few examples of applied efforts underway at the Institute, including the development of a mobile autism assessment unit – a custom van to be used for community outreach in underserved areas, as well as clinical assessments. The Institute’s new space is due to open in the summer of 2013.